The total accumulated exposure or dose of light on a surface is the product of both light intensity (measured in lux) and the time (hours). Example 1) 1000 lux for 1,000 hours =1 million lux hours = 1,000 kilolux hours = 1 Megalux hour. Example 2) 100 lux for 10,000 hours = 1 million lux hours = 1000 kilolux hours = 1 Megalux hour. In typical environments for painting, drawings, or photographs on display year after year, Megalux hours is the practical unit to use because the measurable light exposure dose accumulating on a print surface over time grows to very large values. The unique record identifier corresponding to a specific test sample and its posted Test Report. ID#s are a convenient way for members who have submitted samples to locate their samples or to follow specific tests of interest as the tests progress. They also help AaI&A staff to conveniently update the records. The manufacturer brand and model number of the printer or output device used to produce the test sample. The brand name and description of the ink set or color forming method used to produce the test sample. The term OEM is also typically embedded in this field where applicable. OEM means “Original Equipment Manufacturer”. Searching on “OEM” in this column, for example, will help to distinguish OEM branded inkjet inks from aftermarket (i.e., third party) ink sets. The brand name and description of the test sample’s substrate. The material is often cotton or alpha cellulose paper, but it could also be plastic, resin coated paper, canvas, metal, glass, etc. The brand name and description of any post coating or lamination treatment done to the sample after printing but prior to testing. Note: Gloss optimizers, when printed by inkjet printers during the initial printing pass, are not regarded as coatings, rather as part of the ink/colorant process. However, if a gloss optimizer fluid is applied to the print in an extra pass through the same or other printing device, then it is listed in this column as a coating. The test report column provides download access to individual test reports. Click on the chosen test report to download. If the test report link is colored blue, it is a free document to the public. If the link is colored green it accessible to members only. The test reports are comprehensive documents listing complete descriptions of the sample and its performance in test, and the reports are updated at routine intervals as the testing continues. The Conservation Display Rating is Aardenburg Imaging’s light fastness rating for fine art and other demanding imaging applications. It quantifies the allowable exposure limits before the print sample exhibits visible color and/or tonal changes that would be of concern to the fine art market and museums and archives community. It is a more rigorous standard than is typically used in industry to rate the lightfastness of various products. The Conservation Display Rating sets lower and upper limits of light exposure which the sample can tolerate and still show little or no noticeable fade. The lower limit indicates the exposure tolerated by the weakest 10% of colors in the test sample while the upper limit indicates the exposure tolerated when all colors on average reach a threshold for just barely noticeable fade (i.e., little or no noticeable fade). Higher scores indicate more exposure is tolerated and hence the sample is more lightfast compared to samples with lower scores. Large differences between the lower limit and the upper limit indicate localized or selective color fading in the image is likely whereas a smaller difference in the limits indicates the sample will fade more evenly over the entire image color and tone scale. The Conservation Display Rating column combines both upper and lower values in one field and will sort and filter primarily on the lower limit value and secondarily on the upper limit value. When neither limit has been reached in test, the field will show “PASS”. When the lower limit is reached but not the higher limit the field will express the range with a “+” sign on the upper limit. The “+” sign indicates that the upper limit value is at least as large as the completed test exposure to date. Hence, the “+” marked value also corresponds to the exposure interval listed in the Status column, and more exposure is required to trigger the final value for the upper limit score. See also below, the description of the columns labeled “Upper CDR limit” and “Lower CDR limit”. Higher numbers are always better. For a more detailed explanation of the Conservation Display ratings, please see the document “An Overview of the AaI&A Conservation Display Ratings” located on the documents page of the AaI&A website and also accessible from a link on the test database html page. The Lower and Upper CDR columns numerically itemize the individual lower and upper limit values for more specific filtering and sorting in the database. The Lower CDR column quantifies the lower limit of the Conservation Display Rating. If the lower limit has not yet been reached, the field will show “PASS” as the value. The Upper CDR column quantifies the upper limit of the Conservation Display Rating. If the upper limit has not yet been reached, the field will show “PASS” as the value. By reporting the Lower and Upper CDR values in separate columns, more advanced searches can be made than are possible using the combined Conservation Display Rating column which is only searchable and sortable on the lower limit. The numerical values listed in the Lower and Upper CDR columns agree with the combined figures shown in the corresponding rows of the Conservation Display Rating column. This column indicates the amount of light exposure (expressed in megalux hours of exposure) that the sample has received to date in test. Testing typically continues well beyond the exposure dose required to establish the Conservation Display Ratings and until high levels of easily noticeable fade have occurred. This column can be filtered and sorted by the numeric value in the field. This column posts the expected date for new updates to each report. It is an estimated value, but AaI&A staff tries hard to meet the posted schedule. All test samples are run in a batch with other samples, up to as many as 30 and usually no fewer than 15. The Batch # column makes it easy to post notices on the Aardenburg Imaging home page or News page regarding recent test updates. The latest updates can be found by filtering the database for the batch that was just updated. Batch #s also allow the end user to compare and contrast results of batch related samples with certainty that any unit-to-unit test variability is not a factor in the comparison. In other words, samples in the same batch can be evaluated as a very tightly controlled “side-by-side” paired comparison test. Aardenburg Imaging makes use of side-by-side testing as frequently as possible, for example, to compare the effects of a post coating on two otherwise identical print samples, or as another example, when comparing two print samples made with different ink sets but printed on the same batch of paper to eliminate any possible paper variability effects in the results. Currently, the test type column can be used to readily identify and quickly filter and sort on B&W print samples versus color print samples. In the future this column will get an expanded key word set that can identify other test types such as humidity, ozone, thermal aging tests or alternate testing conditions such as Xenon lamp, cool white fluorescent, “real world” test conditions, etc. At the present time, the sample type column lists only very basic sample type information, i.e, inkjet, chromogenic, etc. This column will be refined in the near future with additional searchable keywords such as dye, pigment, canvas, fabric, paper, RC (resin coated), to further delineate sample characteristics and allow them to be more easily searched. L* is the term for lightness in the CIELAB color model. A perfectly reflecting and diffusing surface (i.e., following a cosine function for illuminance fall-off with angle of incidence) would measure 100.0 on the L* scale. A perfect visual black would measure 0.0 on the L* scale. The Media L* max column lists the media whitepoint L* values. Typical values are above 90 with very bright white papers reaching as high as 98.0. The higher the value the more reflecting the surface and the higher appearance of visual brightness. Aardenburg Imaging reports all L*, a*, and b* values as they appear under a D50 illuminant light source. The D50 illuminant is also theoretical, but in practical terms is approached by 5000˚K (degrees Kelvin) full spectrum light sources such as commonly found in viewing booths used in the graphic arts industry. At approximately 4600˚K and with spectral output closely matching sunlight, Solux® lamps are also a very good choice to set up appropriate print viewing conditions where print color and tone fidelity can be quantitatively measured by D50 CIELAB colorimetry. A measure of the maximum printed black visual appearance (minimum lightness value). Zero (0.0) is a perfect visual black when viewed under standard viewing and surround conditions. Glossy prints typically measure less than 10 with richly printed blacks at 5 or less. Some dye-based inkjet systems in particular can achieve black levels below L* = 2.0 but this impressive blackpoint performance is often somewhat temporary as further drying of the print surface over time can alter the gloss level and raise the value back to 3.0 or higher. Fine art inkjet paper prints with matte finishes typically fall between 15 and 20 for properly printed blacks. Uncoated (plain) papers printed on inkjet papers show L* min values often above 25. Newsprint is often higher than L* = 30. The L* range value is computed by subtracting the measured L* min value from the L* max value of the sample. 100.0 would be a perfect idealized score. Scores above 90 indicate the printing system has excellent visual contrast potential (typical of gloss and luster photo type papers), 80-90 is good, 70-80 fair, and below 70 makes for challenging printmaking because such a system is often only satisfactory when printing carefully chosen images (i.e., ones with small color and tonal range that can be accommodated satisfactorily by the limited system contrast range). 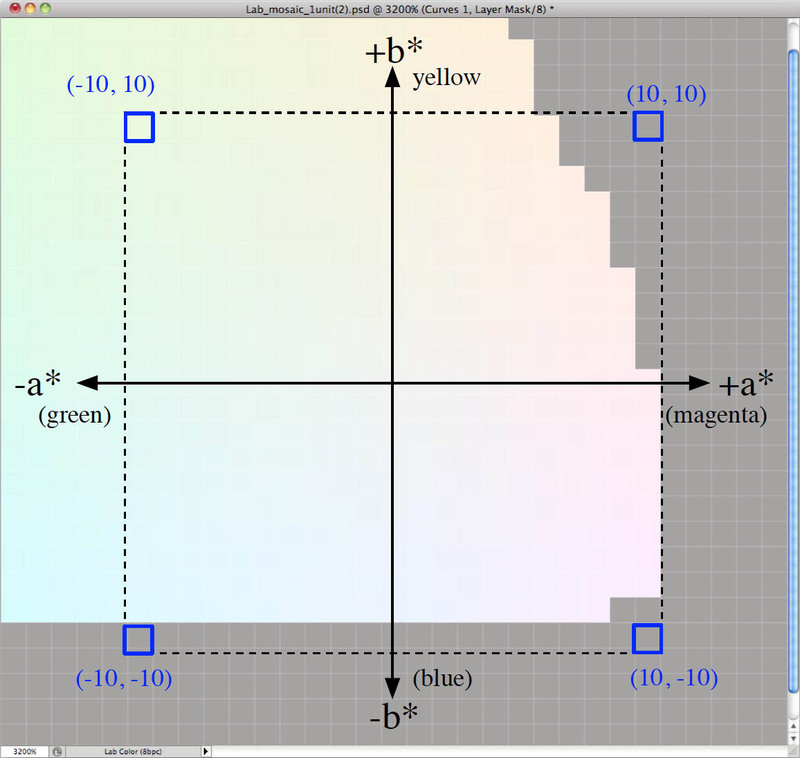 Figure 1a Illustration of media white colors at L* = 95. Origin is neutral, +b* direction is warmer white, -b* is cooler. Measured b* values typically can range several points in either direction, whereas a* values are typically within just a few points of zero. The gray area in this graph denotes LAB values that are out of gamut when viewed on an sRGB calibrated monitor. The a* component of a LAB measurement represents color along a green-magenta opponent color axis in the CIELAB color model (plotted on the x-axis of LAB color charts). Many color experts refer to the a* component as a green-red scale, but in tricolor photography, the a* axis line directly indicates the complementary colors green versus magenta. Increasingly positive a* values denote increasing magenta appearance while increasingly negative a* values denote increasing greenish appearance. Similarly, b* measures color along a yellow-blue opponent color axis (plotted on the y-axis of LAB color charts). Increasingly positive b* values denote increasing yellowish appearance while increasingly negative b* values denote increasing bluish appearance. As a* reaches 0.0 the sample appears neither greenish nor magenta and as b* reaches 0.0 the sample appears neither yellowish nor blue such that as both a* and b* reach zero in value, the color of the sample appears totally neutral under the chosen illuminant. As noted previously, a D50 light source is assumed when calculating the reported LAB values in the Aardenburg Imaging test measurements. Thus, when a* and b* are both zero, the sample has no defined hue and zero chroma and appears to be totally neutral at some lightness value along the L* white-to-black tone scale when viewed under a light source approximating the D50 illuminant standard. Although the LAB color model may seem very much in the realm of scientists and color geeks, it has highly significant value for printmakers and photographers. Indeed LAB color is an accessible color format in Adobe Photoshop which is a key reason why Aardenburg Imaging reports so much test sample data using the CIELAB color model rather than traditional photographic densitometry. The Aardenburg Imaging database columns with L*, a*, and b* measurements and the Aardenburg Imaging test reports give solid information about media white point characteristics and sample tone and color quality. To become more familiar with the meaning of the L*, a* and b* data in the Aardenburg Imaging database study the reported media L*, a*, and b* values while looking at actual corresponding paper samples. Papers that appear cool-white in color will have negative b* values while warm papers will exhibit positive b* values. Brighter papers will have higher L* values (95.0 and above) and high levels of optical brighteners will also tend to push a* positive (more magenta reflectance) and b* values negative (more bluish reflectance). The classic “middle gray” value used by photographers to calibrate camera exposure is well represented by L* = 50, a* = 0, and b*= 0. Also, consider purchasing a reasonably priced spectrophotometer or colorimeter like the Xrite EyeOne, Xrite Colormunki, or Datacolor Spyder3PrintSr units. Remember that the numerical range of the reported media a* and media b* values are still in the range of low chroma colors, ie., nominally “white” appearing media. Much larger positive and negative values exist for truly vivid colors. You will soon be able to train yourself to relate the measured positive and negative a* and b* values with media “warmth” or “coolness” that suits your particular tastes of preferred paper color and imagery. 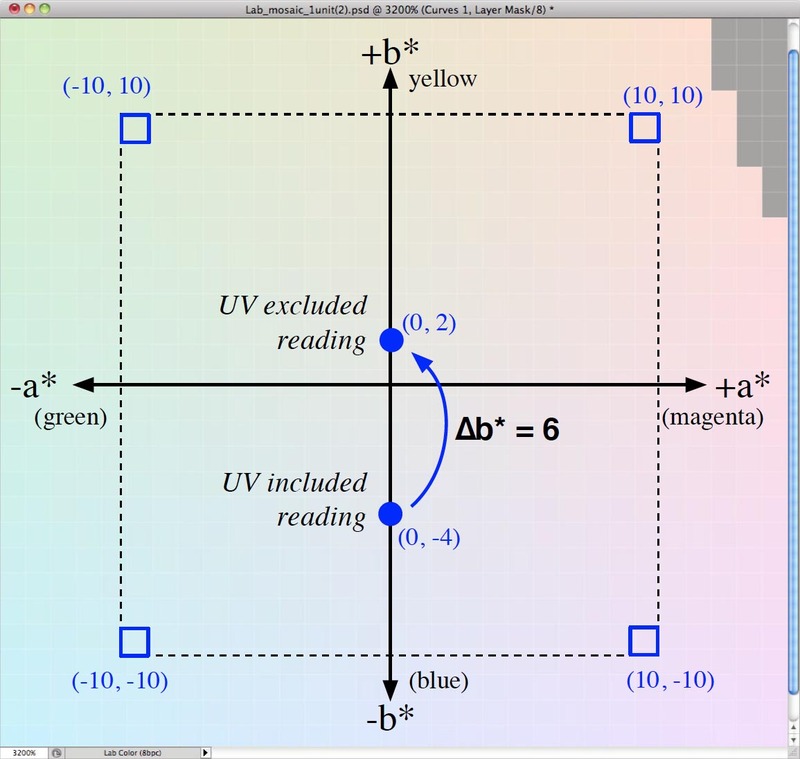 Figure 1b Illustration of media white colors at L* = 90 and an example of UV Δb* influence measurement. In this example the b* value of -4 as measured with UV energy included in the spectrophotometer reading changes to b*= +2 when the UV energy is excluded during the spectrophotometer measurment. Similar to figure 1a, the gray area in this graph denotes LAB values that are out of gamut when viewed on an sRGB calibrated monitor. Because L* = 90 in figure b versus 95 in figure 1a more colors are now in gamut when viewed on an sRGB calibrated monitor. Δb* represents the difference in the CIELAB b* value (blue-yellow axis of color) when comparing two sample measurements. When Ultraviolet (UV) energy is excluded from the spectrophotometer measurement of the media color by means of a UV filter, any fluorescence caused by incorporated optical brightening agents (OBAs) is essentially eliminated. By comparing the spectrophotometer’s UV‑excluded b* reading to the spectrophotometer’s UV‑included b* reading of the same sample, a highly useful measurement of the media fluorescence properties can be made. Samples containing no OBAs typically score Δb* values of 0.0, or 0.1 and usually no greater than 0.3. For Δb* values from > 0.3 to < 2.5, AaI&A categorizes the incorporated OBAs’ influence on media whitepoint color as “Yes(low)” under the column label “Optical Brightener”. From Δb* ≥ 2.5 to < 5.0, the OBA effect is classified as “Yes(medium)”, and for Δb* ≥ 5.0 the OBA influence on media white point is categorized as “Yes(high)”. The yes(high) category is also indicative of print media for which it can be challenging to create well behaved ICC profiles and color managed workflows due to lack of color constancy (sometimes incorrectly called metamerism) under different print illumination conditions that vary in UVA energy content. Hence, the UV Δb* Influence column provides a useful assessment of print sample fluorescence properties. When coatings and/or laminates are added to the final print sample, they can absorb UV energy to varying degrees and therefore reduce the effective fluorescence of any incorporated OBAs in the substrate. Thus, while the measurement of “UV Δb* influence” always characterizes the magnitude of the sample’s fluorescence it does not necessarily characterise the physical amount of OBAs incorporated in the product. In some cases, for example, a sample that would normally fluoresce with a Δb* value of 0.5 (i.e. in the optical brightener yes(low) category) may drop to a value of 0.3 or less when a coating is applied, thus suggesting no OBAs are present when in fact a small amount may indeed be present. In these situations, Aardenburg Imaging tries to obtain and measure uncoated samples of the product as well, and the actual Aardenburg Imaging test reports typically make note on the sample description pages that OBAs are still present. no – sample does not fluoresce under UVA radiation and therefore likely contains no OBAs. yes (low) – the sample fluoresces slightly and probably contains a small amount of OBAs that may fade from exposure to light, heat, and gases (ozone) but media white point will likely shift by only a small amount as a consequence of loss in OBA activity. yes (medium) – the sample fluoresces moderately under UVA radiation and probably contains OBA levels that have easily noticeable visual impact on media whitepoint color. Loss in OBA performance from exposure to light, heat, and/or gases (ozone) or framing under UV filtered glazing (e.g. OP3 plexiglass, museum conservation glass, etc) which deactivates the OBA fluorescence will produce a noticeable change (yellowing) in media color and image highlight appearance. yes (high) – the sample fluoresces strongly under UVA radiation and probably contains high OBA levels that have very easily noticeable visual impact on media whitepoint color. Loss in OBA performance from exposure to light, heat, and.or gases (ozone) or framing under UV filtered glazing (e.g. OP3 plexiglass, museum conservation glass, etc) which deactivates the OBA fluorescence will produce easily noticeable change (yellowing) in media color and image highlight appearance. © 2019 Aardenburg Imaging and Archives.